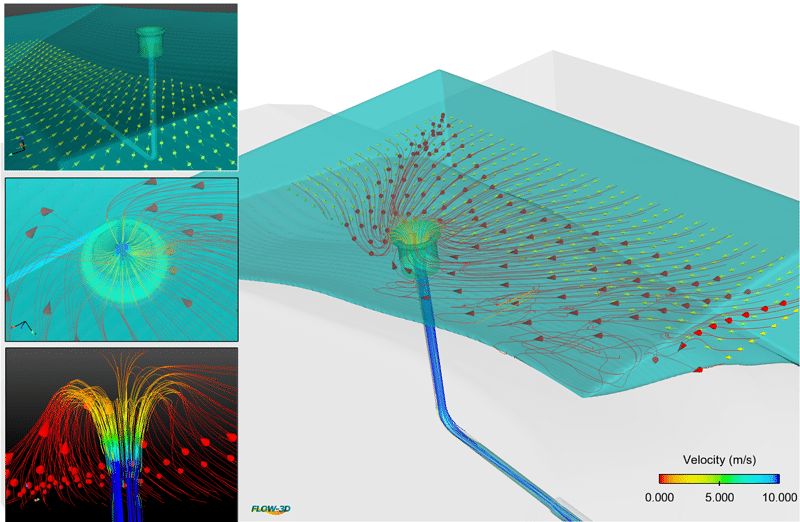 FlowSight is an advanced postprocessing tool designed to deliver sophisticated visualizations of FLOW-3D and FLOW-3D CAST results. 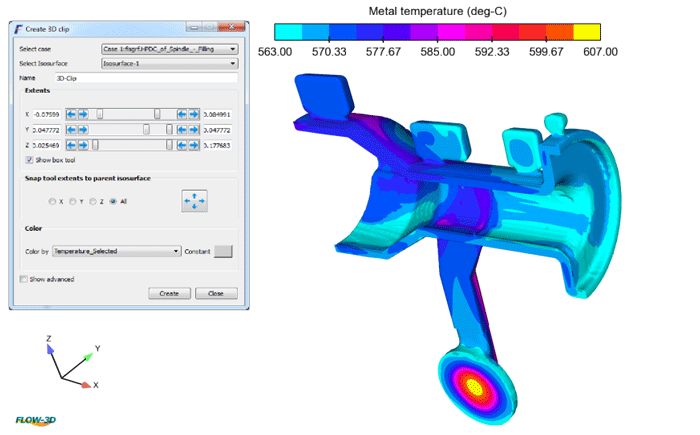 FlowSight provides modelers with superior results analysis capabilities within an intuitive postprocessing interface. Arbitrary 2D clips along spline pathways, 3D clips and transparencies, volume rendering, advanced data time series plotting and calculators, streamline and vector plots are just some of the amazing range of tools available. 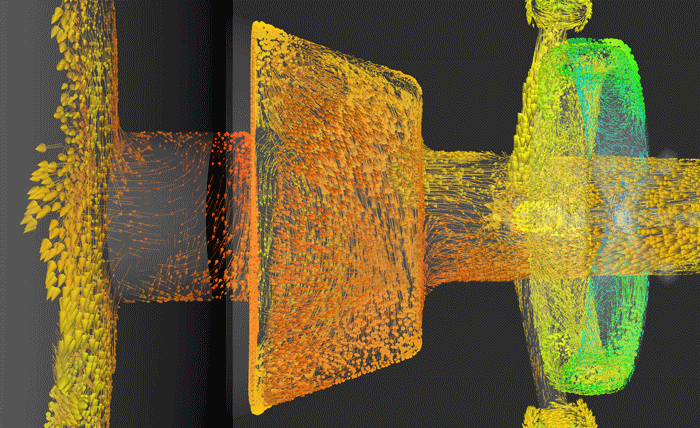 Combined with a rich feature set of multiple viewports and dynamic object visualization tools, using FlowSight allows engineers to make the most of their CFD results for both analysis and presentation needs. FlowSight is included with all FLOW-3D and FLOW-3D CAST licenses. 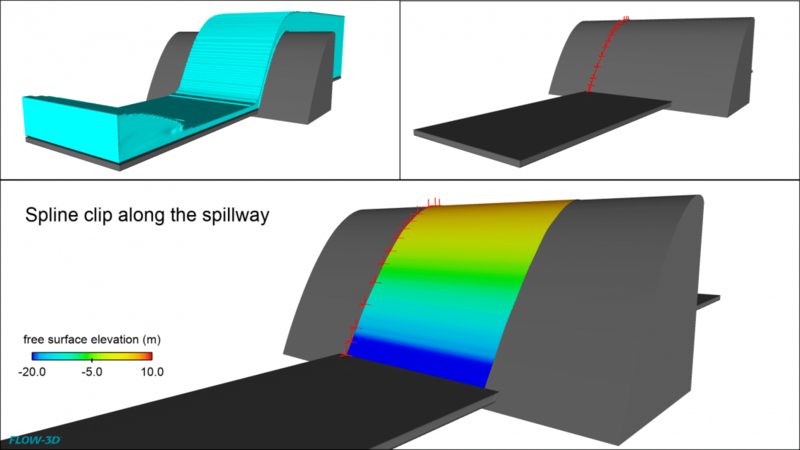 FlowSight’s Spline Clip feature allows users to generate clips along complicated curved surfaces. 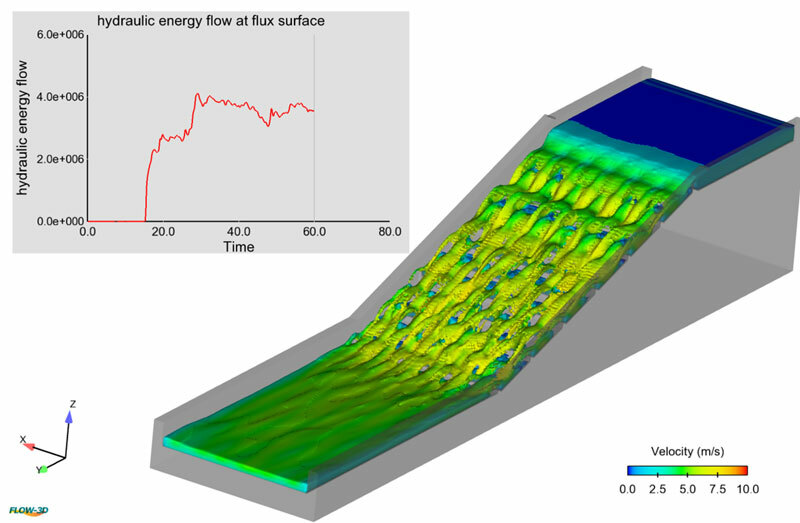 In this simulation of water spilling over an ogee weir, a spline is created along the surface of the ogee weir. The spline is then extruded to generate a clip which is colored by the free surface elevation of water along the surface of the weir. A fairly common issue with analyzing large, complex simulations is that the areas of interest may be obscured by geometry or the area of interest changes as the simulation evolves in time. Keyframing addresses this issue by allowing the geometry to be “cracked open” during analysis and by allowing the viewpoint to move through time and space. This animation demonstrates how the keyframing capability in FlowSight can be used to open the die halves “visually” during filling and display the solid temperature on the die faces while showing the metal filling the dies. 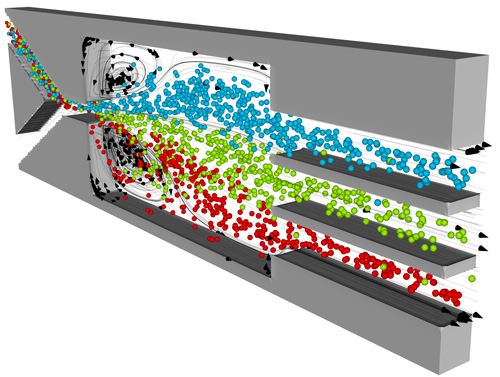 FlowSight is fully equipped with particle visualization capabilities. Particles can be colored by particle diameter, particle density, particle lifetime, velocity and other variables of a relevance. In this case, particles are colored by their respective diameters. FlowSight provides users the option of visualizing the velocity vector field both on a plane or the entire volume speed and direction analyses throughout the domain. The customizable vector fields allow for variable colorization and density/scale adjustments to increase clarity. 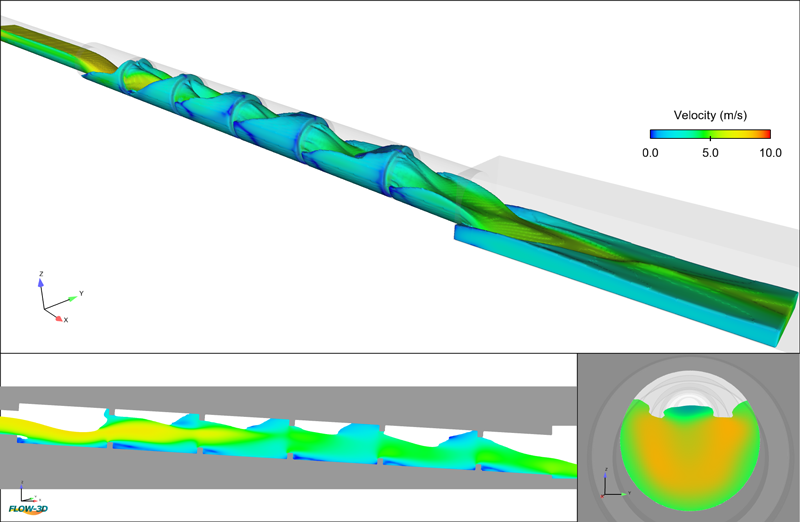 FlowSight’s streamline feature is an incisive way to visualize complex dynamics patterns with full fidelity, providing a realtime snapshot of flow field velocity direction. While pathlines simulate the trajectory of a fluid particle through time, history lines animate fluid particles in the flow field. 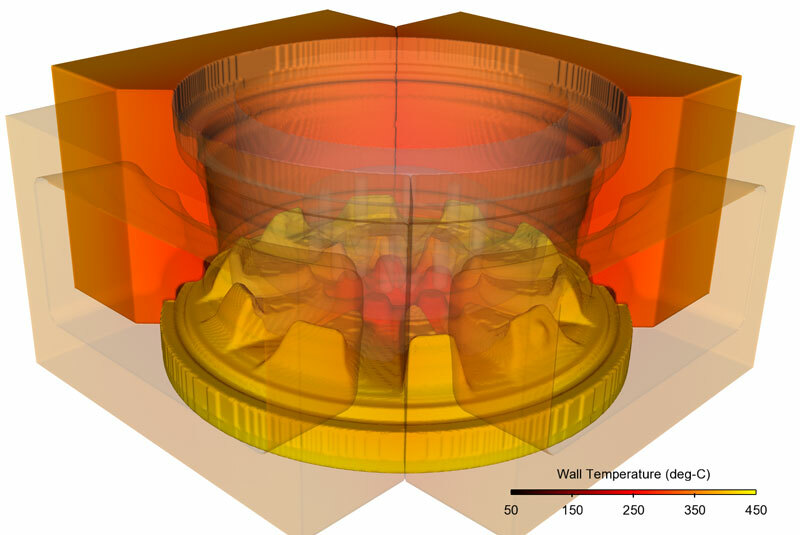 Iso-surfaces are a powerful, quick method for visualizing fluid and solid surfaces, well-suited to displaying constant turbulent energy regions. 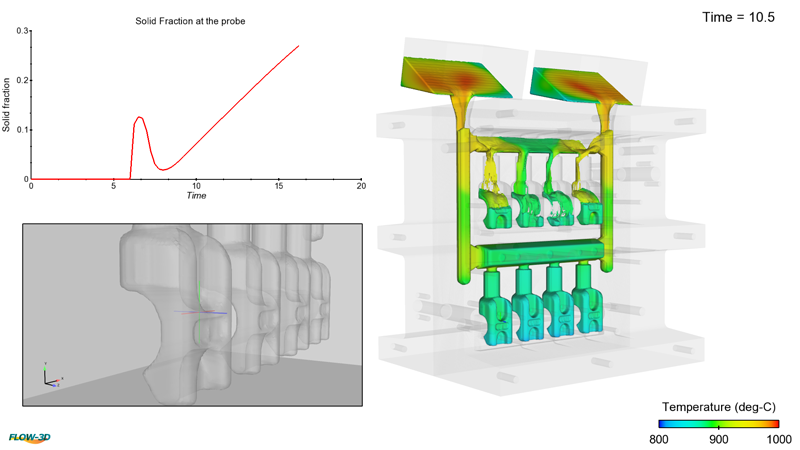 Using a customizable volume map to illustrate a variable throughout the volume, instead of only on the iso-surface. 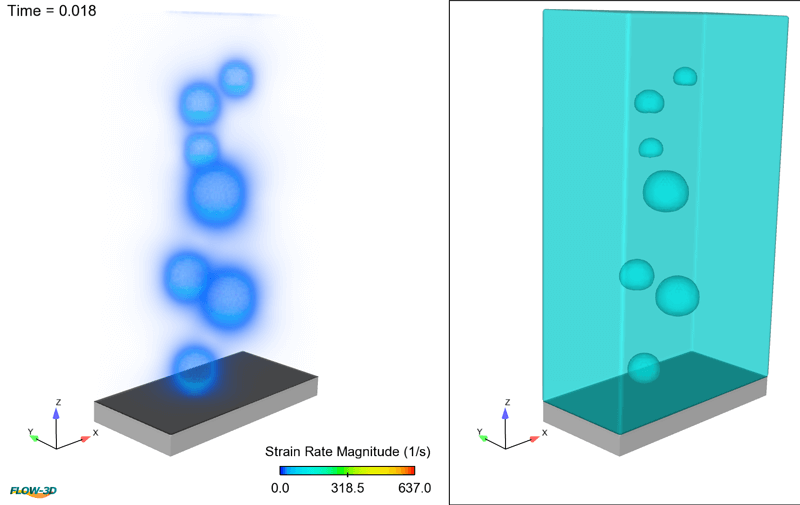 Shown left, the strain rate magnitude of each bubble and the surrounding liquid is shown with volume rendering. Link/view separate cases together in the same viewport. Explore visualizations in both numerical and visual formats. Non-inertial reference frame visualization provides a convenient simulation setup, drives down computational times and lets users visualize their models in a realistic manner. 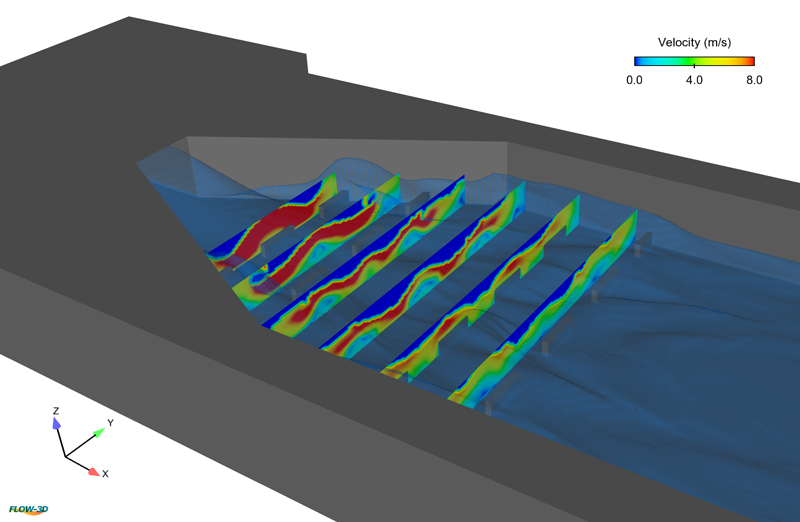 2D Clips are used to visualize a fluid parameter across any cross-section plane. The 3D clipping tool lets users slice the iso-surface in all six directions simultaneously, useful for detecting high defect areas, visualizing temperature, pressure, velocity profiles inside both fluid and solid regions. Analyze surface views with expansive flexibility — including visualization over planar, cylindrical, box, conical, spherical, and streamline surfaces, helpful when fluid flow requires visualization on non-planar surfaces. Arbitrary clips also enable creation of multiple clips in time succession. Point probes illustrate the evolution of a variable over time, a line probe returns the variation of a variable’s values over distance. 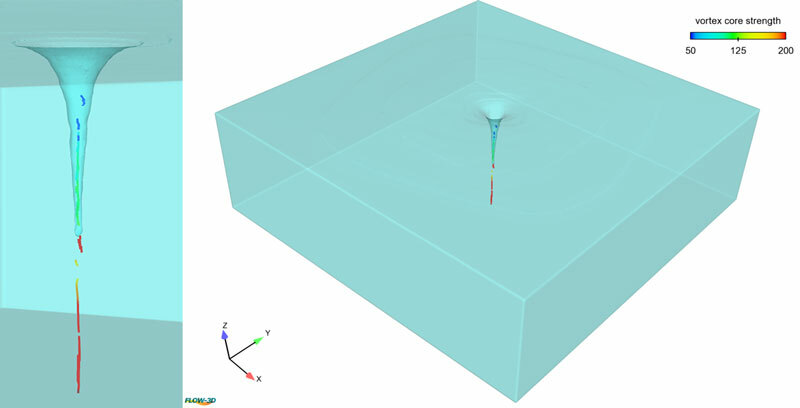 Right, a probe illustrates the solidification fraction of fluid. Two different options are available for vortex core identification — Vorticity and Eigen analysis, allowing filterable result generation based on core strength. Graphing tools brings a robust level of analytics to general history, diagnostics, and mesh dependent data, showing different simulation data comparatively.